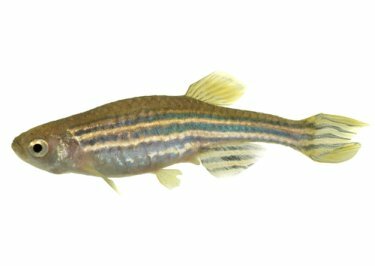 The Zebra Danio is popular beginners' fish and it's easy to see why. It is a hardy, active and peaceful creature making it perfect for beginners and great addition to any community tank. This was one of the first tropical fish I kept. There are two alternative varieties available, the long finned version and the albino version. The Leopard Danio is very similar but with a different pattern on its body. The long finned version is said to be not as robust and active as the original version, having not kept the long finned version myself I can’t confirm this. This is a very active fish; they are also one of the true shoaling fishes. It is advisable to keep them in groups of 10 or above, so you can witness their shoaling behaviour to best effect. 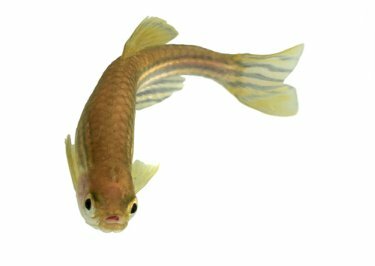 Despite being very active they are not aggressive in any way and will live happily with most other freshwater aquarium fish. When I kept these fish I housed them in a 60 litre aquarium. They seemed pretty happy in there. However as I’ve already mentioned these are shoaling fish, so the group and large the aquarium they live in, the better the shoaling display will be. If possible include some plants in the aquarium, but perhaps more importantly make sure there are lots of wide open spaces for them to swim about in. They are hardy fish and will adapt to most water conditions. I would recommend a tempture of between 18 and 25 C and a neutral pH. They are not fussy eaters and accept pretty most eat any food, although live food is always welcome. Zebra Danios were first fish I ever bread and it was by accident, this shows just how easy they are to breed. I had brought 10 of these fish and housed them in a quarantine tank for 2 weeks to reduce the risk of introducing diseased fish into my community tank. When I was happy the fish were healthy I moved them into to my main tank. A few days later, when I was emptying out the quarantine tank I noticed very tiny black things in the water. On closer inspection I realised they were fry (baby fish). Unfortunately I had already chucked half the water and probably a lot of fry out before noticed them. The fry grew quickly and luckily a friend of a friend had a large empty tank and so after a few weeks the fish went off to their new home. They are egg scattering fish that do not care for their young. They will breed prolifically and will lay between 300 and 500 eggs at a time. When makes these fish a bit different from other egg scattering fish is that they mate for life. If you want to breed these fish I would recommend setting up a separate breeding tank. The eggs will be eaten by both other fish and their parents if left in the community aquarium. You should cover the bottom of the tank with either a breeding mesh or course gravel. This will make it difficult for the adult fish to eat the eggs. I have also heard of people using marbles in breeding tanks for egg scattering fish. I can see how the gaps between the marbles would provide good protection for the eggs. However I would worry that the unnatural look of the marbles would stress the fish. Once the fish have spawned remove them from the breeding tank. The eggs should take around two days to hatch. Once they have hatched the fry will be really tiny. They will look like little black lines with a slightly larger dot at the end. Feed them liquid fry food and then when they get bigger feed them crushed flake food.